This is one of those books that I’ve read a dozen times in my life & one that never gets old. And with the release of the second Hobbit movie, I figured it was time to read it again. Peter Jackson did a great job with the Lord of the Rings movies, keeping them as close to the books as he could, given the restraints of the cinema. I assumed he would do the same with his newest movies, although I was confused as to how he could make three films out of a short book. I thought refreshing myself on the finer points of the novel would be a good idea before I watched the films, as I hadn’t seen An Unexpected Journey yet and Desolation of Smaug hadn’t come out yet. As with every time I reread it, I am glad I did, because it’s one of the best I’ve ever read and the fantasy story that’s nearest to perfection. The hobbit to whom the title refers is Bilbo Baggins, a wealthy & respectable little creature who lives a quite & comfortable life. Hobbits aren’t magical, they aren’t brave, but they are generous, kind, peaceful, love good food, a good pipe, and don’t often leave their homeland. But when Gandalf the wizard comes knocking, Bilbo knows he is in for an adventure. He is recruited to join a band of dwarves, led by Thorin Oakenshield, on a quest to recover their lost treasure. Years ago their home, the Lonely Mountain, was attacked by a dragon and he resides there still, protecting the ancient dwarven treasure deep inside the mountain stronghold. The party mean to get it back, defeating their ancient enemy, and reclaiming what is rightfully their own. 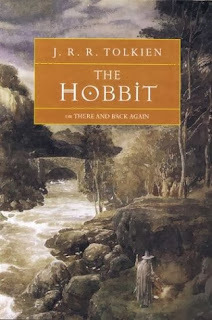 Bilbo, confused as to why he is even being asked along, finds himself whisked away on an adventure that will change his life & the lives of countless other to come in what is just the beginning of a great & epic tale. It’s not an exaggeration to call The Hobbit one of the best books that has ever been written. Is it concisely & beautifully written, a story simple, exciting, and grand. Tolkien took ancient legends & old stories, mashed them together, and created a magical world that has never seen an equal. This is just one small story in the epic landscape of Middle Earth, but one that has extreme significance on the remaining history of that world. It feels almost real, it is so detailed, lush, and well written. Credit Tolkien with the foundation of the Journey Story that you will read countless times over if you’re a fan of fantasy as a genre. And even if you’re not, The Hobbit is not a book that requires you to love elves, magic, and heraldry. It can be enjoyed by any person of any age, and that’s one of the qualities that makes it so great. The characters are funny, lovable, relatable. The story is action-packed, broad-scoped, just plain fun. And the writing it poetic, memorable, ground-breaking. There aren’t enough adjectives to describe what is undoubtedly a classic among classics. Chances are you’ve read it once in your life; if you have, read it again & if not, read it right now.